As well as researching better tailoring techniques, I also looked closer at the design of the coat and improved the cut of the coat. I had become especially interested in how the back of the coat had been designed. I noticed this in a particular shot during the first episode of season three, seen here. The back appears to be made of a series of vertical strips. In fact, this is actually four long darts (two on either side of the middle gusset) from the shoulders, level with the arms, down to below the waist. This gives the back a very snug tailored fit across the small of the back and accentuates David's tall frame. I followed this doing my best to replicate this in the Mk II. There are also what appear to be pleats inside the slit up the back of the coat. It made sense the folds of the gusset above carried on down to the hemline. I later discovered I had been slightly miss-footed by the original Honest Dragon coat, which I was (maybe foolishly) still referring back to. 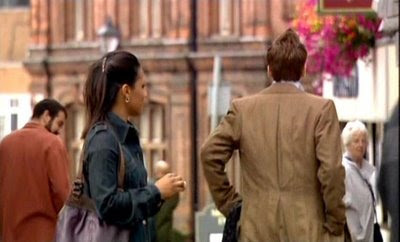 That coat, and my coats to that point, have the back made out of a single piece of fabric pleated to create the gusset. I later realised that it does have a seam up the centre, which allows for more material below the waist line - but more of that in a future posting . . . . I proceeded to replicate this as best I could, given the images I could find, and put in some buttons, which I had spotted in a couple of quick scenes in season four. I paid attention to the angle and shape of the pocket flaps and the shape of the lapels and collar - but to be honest I still did not get it right on the Mk II pattern, but it was still a vast improvement on what I had done before. I will cover lapel shape in more detail in a future blog . . . .
One important difference in the way I made the Mk II was the integral order in which assembled the coat. When I made the Mk I, I was very excited and out for quick gratification, so I set out assembling the body of the coat so I could try it on after only sewing half a dozen seams. I them 'decorated' the rest of the coat; putting in pockets, adding lapels etc. The draw back of doing it this way is that you have to man-handle the entire coat when trying to sew welted pockets, which is very hard. It is a bulky coat! For the Mk II, I cut the panels for the body of the coat, then set the pockets, sewed the back darts etc BEFORE putting the body of the coat together. This is SO much easier and it is the way I have done all my sewing in future. A tip worth noting.